Update: These photos are, as far as I am aware of after extensive searching) the first publicly made ‘real’ photos of Kristin Joy Diede and Robert Anderson. By ‘real’ I mean quality enough that you can actually see how these two missing persons looked. The Charley Project and other websites have very poor quality photos. In the days and weeks to come I will be publishing more several more photographs. Much more information will follow that. If you wish to receive information about the developments please send and email to unsufferus@gmail.com and state as much. On August 26, 1993, 32 year old Robert Michael Anderson was reported missing. Anderson was in the company of his 30 year old girlfriend, Kristin Joy Diede. Anderson and Diede had taken Diede’s two children to visit relatives in Wishek, North Dakota. Anderson and Diede were last seen on August 15, 1993, in Wishek. On August 20, 1993, a Dodge van being driven by Anderson and Diede was found abandoned in Aberdeen, South Dakota. It is believed Anderson and Diede were homicide victims. Anyone having information regarding the disappearance of Robert Anderson or Kristin Diede is asked to contact the Logan County Sheriff’s Department at 701-754-2495, or the North Dakota Bureau of Criminal Investigation at 1-800-472-2185 or 701-328-5500. 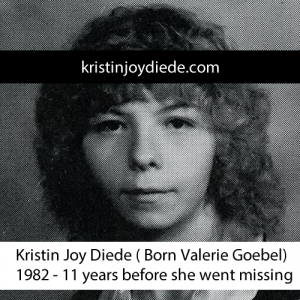 On August 26, 1993, 30 year old Kristin Joy Diede was reported missing. Diede was in the company of her boyfriend, 32 year old, Robert Michael Anderson. Diede and Anderson had taken Diede’s two children to visit relatives in Wishek, North Dakota. 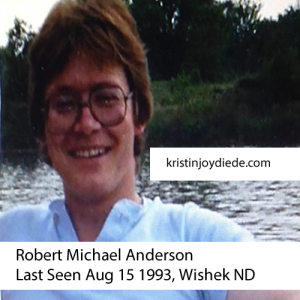 Diede and Anderson were last seen on August 15, 1993, in Wishek. On August 20, 1993, a Dodge van being driven by Diede and Anderson was found abandoned in Aberdeen, South Dakota. It is believed Diede and Anderson were homicide victims. Anyone having information regarding the disappearance of Kristin Diede or Robert Anderson is asked to contact the Logan County Sheriff’s Department at 701-754-2495, or the North Dakota Bureau of Criminal Investigation at 1-800-472-2185 or 701-328-5500. Email: unsufferus@gmail.com | send an email if you want updates.